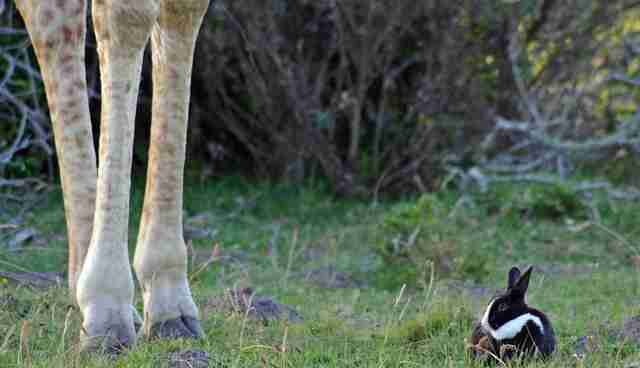 "The bunny would eat a bit and then hop further off with the giraffe following." Friendship can be found in the most unusual places and sizes. Ayesha Cantor, owner of the Kragga Kamma Game Park in South Africa, was driving with her 21-year-old daughter Tammaryn when they spotted something that made them hit the brakes and get their cameras out. 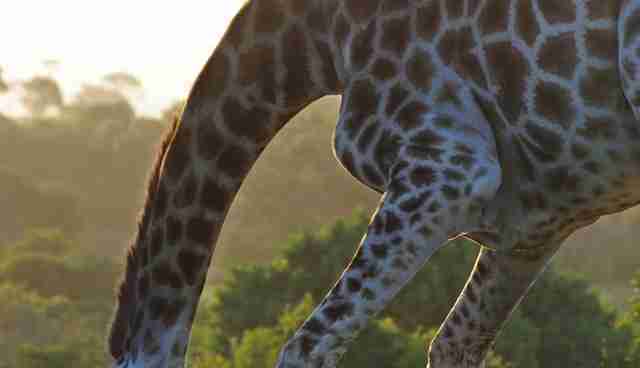 "I thought to get a few 'giraffe in the sunset' images, noticing one who kept arching his neck beautifully," Cantor told The Dodo. 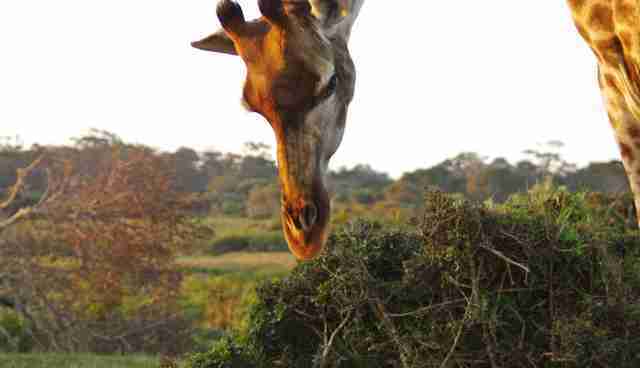 "We didn't immediately realize that there was something that had the giraffe's attention on the ground." They followed the line of the giraffe's gaze. There in the grass was a tiny black and white animal - a rabbit. 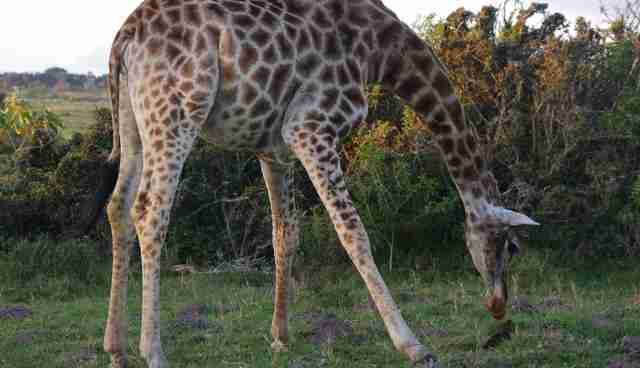 "We were so surprised to see a domestic bunny right under the feet of the giraffe," Cantor said. 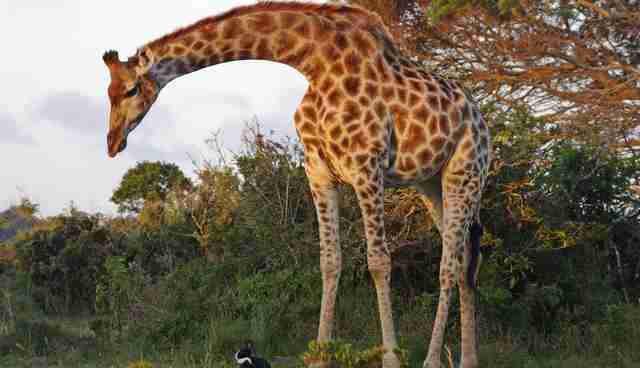 "Totally unfazed, even stretching out fully between the giraffe's legs." 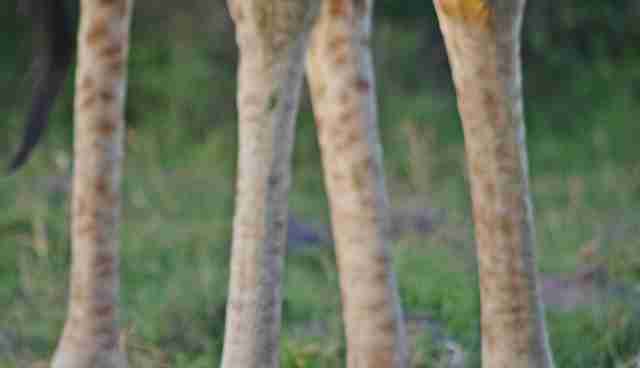 The giraffe was a type of Southern giraffe that's indigenous to African countries like South Africa. But the rabbit was a domestic animal that had no business being in the African bush. Cantor and her daughter guessed the rabbit had escaped from a neighbor's rabbit hutch. They were amazed it hadn't already been eaten by predators! As they watched from the car windows, they expected the rabbit to dash away, especially when the giraffe started moving around. But the rabbit stayed close to his long-limbed buddy. "He showed no signs of wanting to get away," Cantor said. 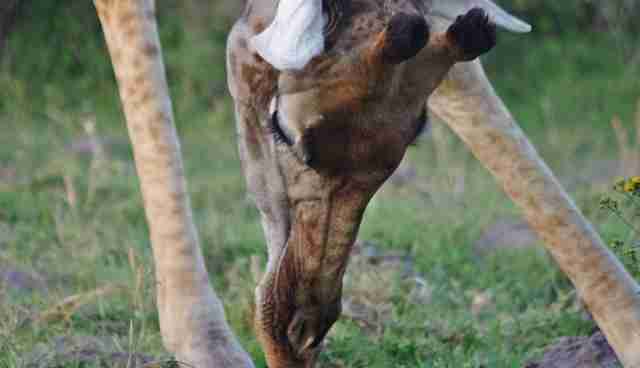 "The giraffe would bend over and have a sniff and nuzzle. 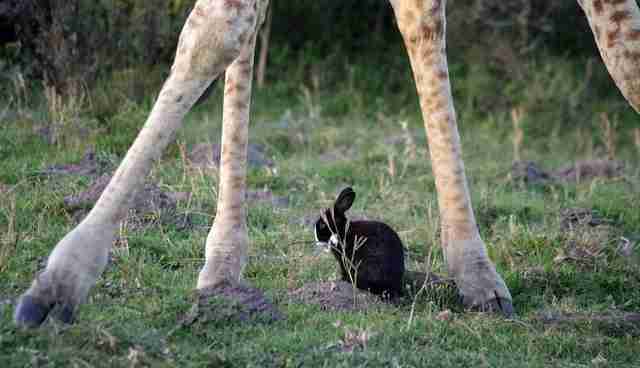 The bunny would eat a bit and then hop further off with the giraffe following. 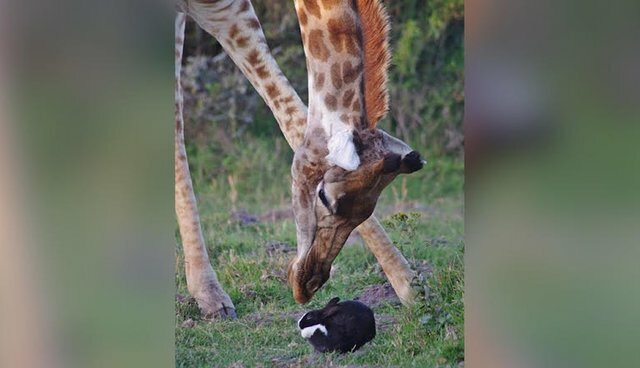 Sometimes it looked as if the giraffe was going to paw at the bunny with his giant hooves, but he was so gentle, never actually striking him. Amazing that the bunny showed absolutely no signs of fear." Cantor and her daughter watched the odd couple for 45 minutes. They eventually left because it was getting dark and couldn't take good photographs anymore. 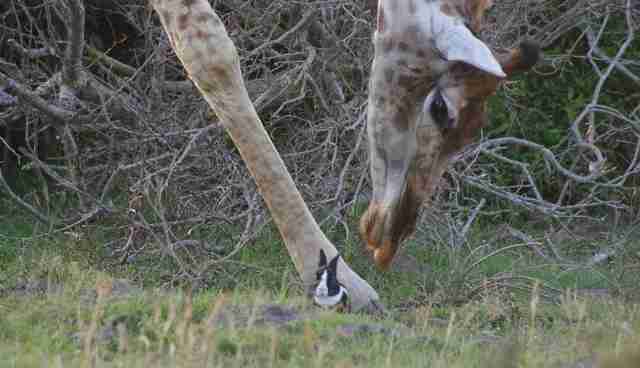 But the giraffe and rabbit were still together when they drove off. "This is a most unusual sighting," Cantor said. "It's a miracle really that [the rabbit] has survived in the park. Being of domestic stock it wouldn't have the same survival instincts that a wild rabbit would have. Predators like jackal and caracal would have and should have made short work of it by now. Maybe Mr. 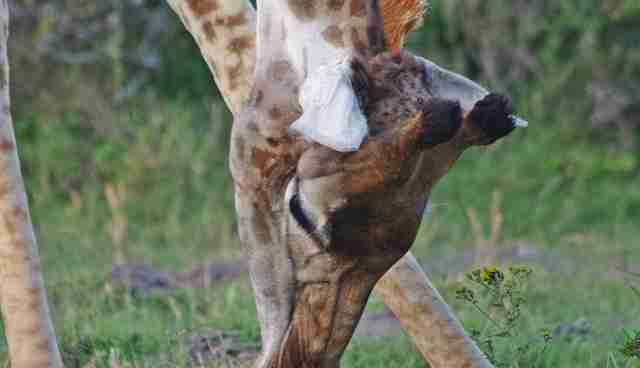 Giraffe really does do a good job of keeping his buddy safe."